Located within walking distance of the antique theatre and the centre of the old town, you will enjoy the Provence in the shadow of limetrees with the chirping of the crickets as background music.Accommodation for four persons, will contribute to a peaceful and sunny holiday.Our location, 10 minutes within walking distance from the towncentre, will offer you a unique combination of town and countryside. It has everything you need for a stay. Frederique and Eric are the perfect hosts and the house and poo provide perfect Provencal hospitality. The two of us had a memorable stay at this property in mid-May. All was as described and photographed - a comfortable little 2-bedroom, 2-storey 'house' tucked away in the corner of the owner's beautiful garden. It was cooler then so we didn't use the pool, but tried to make the most of our private front terrace and garden - especially in the afternoon when the sun poured in. Location is very private and peaceful. It is about 10 minutes' easy walk on quiet streets and paths from the centre of 'Vaison' and main sights and was a wonderful base for touring the surrounding scenic villages and countryside. A bottle of wine and home-made apricot jam welcomed us. There was parking space for us off-street and plenty of linen and kitchen equipment for a longer stay. (We ate out every night in the many bistros in the heart of old Vaison.) Washing machine was terrific! The bathroom upstairs is roomy with a big shower recess; heating is installed throughout in case of a cold snap. Owner Frederique was most helpful and welcoming. 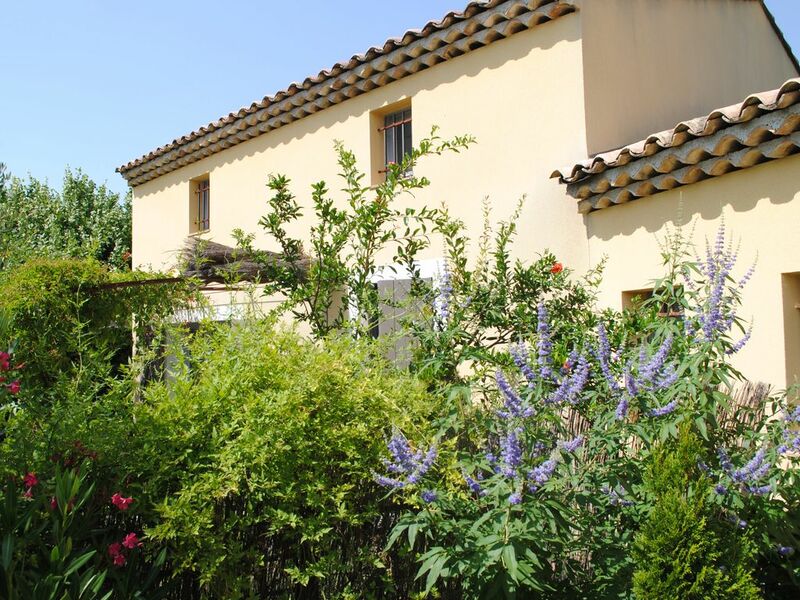 A beautiful little slice of Provence - privacy assured. Highly recommended. Pleasant time spent between exploring the town, walking in the mountains and relaxing around the property and pool. The large property afforded us time and space to enjoy ourselves. We had the great pleasure to stay for a week in one of 2 beautiful apartments on this property just a 10 minute walk from city centre of Vaison-la-Romaine. The hosts were very attentive and since they were onsite, were always available. The unit is spacious and well equipped. The weather wasn't warm enough to use the pool, but it is easily accessible. We did enjoy our patio as well. The neighbourhood was great for evening walks, and we often walked downtown to restaurants or to see the roman ruins. If you are coming, note that the toilet is on the main floor, while the bedroom and shower are upstairs. The second bedroom is at the back of the main floor. There is a large supermarket very close (2 minutes by car or 10 minutes walking). So, overall, very convenient, and an enjoyable week. With our family of 4 we had an excellent 2 weeks in this great holiday home in the Vaucluse. Thank you for your hospitality Frédérique! We are looking forward to our next stay. Nous confirmons en tout point les précédentes évaluations, que cela concerne l'accueil, l'amabilité et la serviabilité des propriétaires, comme le gite par lui même décoré avec goût, entièrement équipé et très bien situé, permettant de se rendre à pied dans le centre ville de Vaison en quelques minutes. Nous reviendrons avec plaisir lors de notre prochain séjour à Vaison.